Interested in starting Aikido training? Please check our schedule below and simply come watch any class. Our friendly instructors & senior students will be happy to answer any of your questions before or after class. 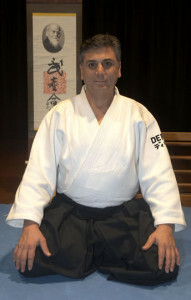 Derek Minus is the chief instructor at the Ku-ring-gai dojo, which he established in 1982, on moving to the area. He is an internationally qualified Aikido instructor, ranked 6th Dan by the Aikikai International. He has been practising Aikido for over 35 years and is also qualified to instruct Aiki-ken (sword) and Aiki-jo (staff), holding four weapons teaching certificates awarded by Morihiro Saito Sensei. He is also a NCAS Accredited Level 2 coach.